This product requires the base game Cities in Motion. The flagship of a vehicle North Italian company, Vettore is one of the largest buses ever produced. It provides two floors of comfortable seating with stairs in the front and rear. It can handle a large amount of passengers. The Comet Ambienta was introduced in 1995 by a successful Swedish manufacturer. The design features smooth forms inspired by nature and recent developments in space engineering. Designed to be as environmentally friendly as possible, it is one of the cleanest buses ever produced. It has very low levels of exhaust emissions and runs extremely quietly. Belgian helicopter manufacturer Roto-Tec was formed following a merger of two smaller companies. The Leopard was initially designed to meet the growing needs of transportation to oil rigs. It features two reliable turbo-shaft engines and an especially robust fuselage. 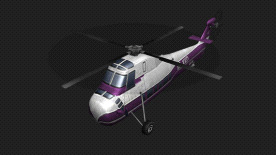 The Leopard is a medium-heavy helicopter with a good seating capacity. Prospecta Experimental's design aims to break not only the conventions of tram design but those of the public transportation as a whole. It features large windows, smooth surfaces and most notably, the zigzag configuration of the tram cars. The seating layout is designed to encourage social interaction among passengers leaving empty, open spaces in the cars. One peculiar feature in the design is the use of balconies, giving a luxury feeling to the tram. Prospecta Experimental runs on electricity and therefore is a very green choice for the environmentally aware traveler. W700 is a 6-car aluminum metro train manufactured by the combined American-Japanese Capitol factories. It is the seventh generation of driverless metro trains which are remote-controlled by an automatic train operating system. In order to handle peak hour needs, the cars have a longitude seating arrangement, this allows more room for standing passengers. The W700 has low maintenance costs and provides increased energy efficiency. Cities in Motion is required to play this DLC.